In mammals, the umbilical cord is the organ connecting the placenta of the pregnant woman to her embryo and then foetus at the umbilicus. Two arteries and a vein run along it through which the mother provides oxygen and nutrients to her baby and the baby returns carbon dioxide from its metabolic activity. Afterchildbirth, the cord must be cut in order to separate the mother and child, which marks the point when the baby's feeding becomes independent. A visual trace remains throughout life, the umbilicus, or more commonly called the belly button. 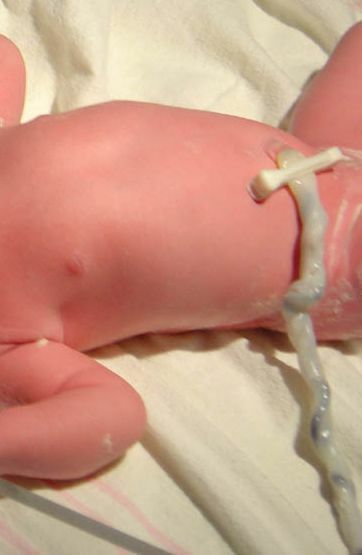 The umbilical cord is also used in biomedical research once it has been removed as it contains stem cells.